We are always offering something for kids, grown ups, or the whole family. See what we’re up to below! Viking is 25! To celebrate this incredible milestone we are doing something BIG. We are are giving away over $10,000 worth of stuff including Open Play passes, School Vacation Camps, Parent Date Nights, Private Lessons, PTO events, Clinics, and SUMMER CAMP. Viking Date Nights are here! Offered once a month, these 3 hour evenings allow you to do you. 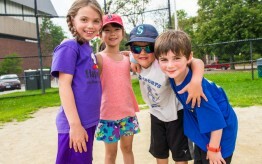 Kids enjoy a fun evening of sports and games, followed by dinner and a movie. Offered on select Friday evenings during the winter and spring. We held our first formal Holiday Banquet to honor coaching excellence and to promote deserving staff to Senior roles within Viking.